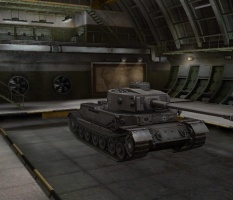 The Tiger (P) is a German tier 7 heavy tank. On May 26, 1941, Adolf Hitler ordered Ferdinand Porsche and the Henschel company to develop prototypes of a new heavy tank. The prototypes were shown to the Führer on April 20, 1942. Manufacturing began, but the production run was cut short due to the complexity of the tank's drive and control systems, and a shortage of the required copper. Later, 90 produced hulls were converted into Ferdinand tank destroyers. While in stock form, its 7.5 cm KwK 42 L/70 is insufficient for targets above its tier. Once its accurate and powerful 8.8 cm KwK 43 L/71 is mounted, the Tiger (P) becomes a real sniper, capable of destroying higher tier tanks. Its unusually thick hull armor and the 100mm thick mantlet covering the frontal 100mm plate of the upgraded turret makes it hard for many enemy tanks to penetrate frontally. It has a slightly different game style compared to its cousin, the Pz.Kpfw. 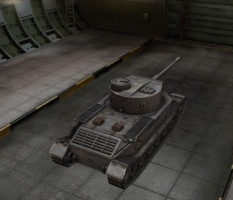 VI Tiger; it has less engine power, the same weapons, a lower rate of fire, a lot more armor on the front, and lower top speed. Like the PzKpfw VI Tiger, the Tiger (P) excels as a sniper, though with its 200mm thick hull front, it is capable of leading the charge if required. The Tiger (P) leads to the Tiger I, the VK 45.02 (P) Ausf. A, the VK 100.01 (P), and the Ferdinand. - It can used to shift into 4 lines; All of 3 Germans superheavy line and JPZE100 line. - Extremely prominent Commander's hatch can be an easy target. - Extremely weak treads, easily damaged/destroyed. Depending on the map, with its frontal armour and sluggish speed it can lead the front of a group assault or act as tough second line to counter breakthroughs. The problem is that the tracks, turret and sides are vulnerable, so it needs another tank to cover its rear. The top gun is reliable at causing damage but has a fairly standard rate of fire for a heavy tank. Due to its low speed, you have to be cautious of arty. The large gun mantlet also adds a significant amount of protection to the front of the turret. The strong front armor makes it impervious to shells from most Tier 6 tanks. Many conventional T7 tanks will also have trouble penetrating. However, it has no slope and relies instead on thickness alone. Powerful HE shells can deal nominal damage to your front, so angle it for maximum effectiveness. This tank rewards angling greatly, so use it as much as you can. Hozever, take care not to expose the ``cheeks of teh hull armopur next to the massive frontal plate. They are only 80mm thick and can be penetrated by nearly every tank the Tiger(P) encounters. Of course, the sheer thickness can usually stop most shells, but beware higher tiered tanks and their guns. The turret has 100 mm of frontal armor coupled with a thick gun mantlet, which is good enough for most conventional shells. Most unfortunately, the cupola is tall and weak, almost negating your armor. From a distance, though, it is hard to hit, so stick to sniping. Although the armor on this tank is impressive, its speed is not, so avoid combat. Stay away from the fight and snipe unsuspecting foes. Do note that your speed will make it difficult to run when you are eventually discovered, so have an escape route planned. If you must fight close-quarters, have some allies to cover your flanks and protect you from fast enemies. When you are top tier, don't be afraid to show your enemies how thick your armor is. The armor on this tank can be an effective frontal assault leader. The plate bolted over the driver's view port and radioman's machine gun are vulnerable. The lower glacis plate is thin (a well-aimed shot with the M4 Sherman's M1A1 is able to penetrate). Keep this in mind while fighting. 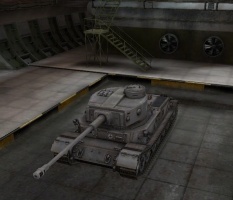 Overall, the Tiger P is a formidable tank that can really scare enemies if caught off guard. Sniping is the best option, but sometimes you can give your opponents a firsthand experience of just how good German armor can be. Best used at close to medium ranges with the aid of your allies, aiming at vulnerable points of enemy tanks. A good hit is able to cause critical damage. Even so, the low pen and RoF makes this gun hardly usable for this tier. 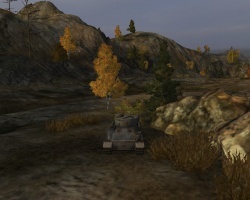 The 75 mm gun has better penetration than the shorter 88 mm L/56 but it deals lower damage. In terms of engaging tier 7 tanks and above, it packs a menial punch. 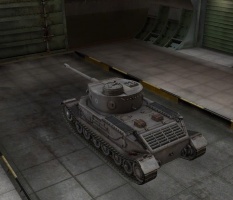 With the combination rate of fire and accuracy, the 75 mm gun can be used to suppress lower tier tanks. It is advisable to stay away from the enemy and aim for their weak points, if possible. A good shot with this gun is able to cause good damage. This gun, which is the top gun on the VK 30.01 (P), has lower penetration than the 7.5 cm KwK 42 L/70, but it has more alpha. The low penetration of this gun is not enough to fight off tiers 7 and above. You should aim at thin or vulnerable points of the enemy tank, if possible, from a distance. This is the most powerful gun for this tank. It has very good penetration for its tier and excellent accuracy. It works best when fired from long and medium distances, to benefit from the gun's accuracy and rate of fire. A tank with this weapon can arrange some very unpleasant surprise attacks. The 8,8 cm KwK 36 L/56 Gun, 2x Porsche Typ 100/3 Engine, and FuG 12 Radio carry over from the VK 30.01 (P). Mount them immediately. The 8.8 L/71 requires the tracks, so research those first. Next research the gun itself, which will really boost performance. 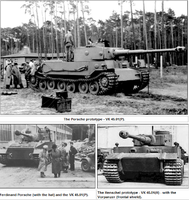 Finally, research the Tiger-(P)-Turm Ausf. F Turret. 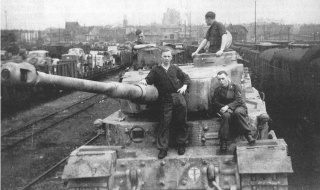 Only one completed Tiger (P) with chassis number 150013 saw combat service as a command tank - Panzerbefehlswagen VI (P) with schwere Heeres Panzerjager Abteilung 653. It was used by its commander, Hauptmann Grillenberg (turret number 003), on the Eastern Front in early/mid of 1944. On May 26th of 1941, during the meeting concerning the development of new weaponry, Adolf Hitler ordered both Dr.Porsche and Henschel to supply their designs for a heavy tank, which was to be ready in the summer of 1942. Krupp was in charge of supplying main armament and producing turrets for designs by both Henschel and Porsche. The project was known as the "Tigerprogram". Henschel Tiger’s development was based on previous designs of VK 3001 (H) and VK 3601 (H), while Porsche Tiger’s development was based on previous design of VK 3001 (P) - Leopard. None of those vehicles entered production but they provided designers with valuable experience. The new 45-ton panzer was to be armed with a 88mm KwK L/56 mounted in a turret designed by Krupp. Development of Porsche’s Tiger was progressing much faster than that of Henschel since Porsche worked on an independent project for heavy tank since autumn of 1940. Henschel was not that advanced and utilized as many already available components from its previous projects to complete its VK 4501 design. In order to speed up the development of VK 4501 (P), components of VK 3001 (P) were modified and used. The suspension was modified version of the suspension used in the VK 3001 (P) prototype. It was made up of six road-wheels and lacked return rollers. Tracks had 109 links per side and were 640mm wide with track surface contact of 4175mm (4.175m). Tiger (P) was powered by two (air-cooled) Porsche Typ 101/1 engines mounted in the rear part of the hull. Gasoline engines drove electrical generators, which drove two electric motors, which provided power to the tracks.Gasoline engines were produced with defects and were repaired but remained unreliable, while electric system used copper, which was a critical war material. Drive sprocket was in the rear instead of the standard location at the front. Electric transmission system was used similar to that of the VK 3001 (P). Overall gasoline-electric power/drive system with which many problems were encountered (such as engine fire) was utilized. Its power/weight distribution limited its cross-country performance and during trials, VK 4501 (P) prototype was often bogged down (especially in the soft ground) and had to be towed away by recovery vehicles. From left to right. Albert Speer, Ferdinand Porsche and Tiger (P) prototype vehicle. Both, Henschel and Porsche’s prototypes arrived to a station near Rastenburg on April 19th of 1942 and then traveled 11km to Rastenburg, while constantly breaking down.On April 20th of 1942 at 11:00am, both Porsche and Henschel prototypes were presented to Adolf Hitler (on his birthday) in Wolfschanze (Rastenburg), East Prussia. Tests were scheduled for July and preliminary tests proved that the Tiger (P)’s design was far from being perfect and modifications were made, but none of the technical problems were fully solved from the lack time. Both VK 4501 (P) and VK 4501 (H) were armed with powerful 88mm KwK 36 L/56 gun, developed from 88mm Flak 36 L/56 gun. Originally, Krupp designed and produced the turret for Porsche’s VK 4501, but then it was modified and used by Henschel’s VK 4501. The first eight turrets produced had lower sides and a flat roof with raised centre section to allow the gun to be depressed through larger arc. 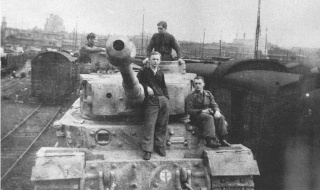 Tiger (P) had its turret mounted forward, what also made the operating in enclosed areas dangerous. In July of 1942, both prototypes were put to the extensive tests at the tank school in Berka, Germany. During the tests, Porsche’s VK 4501 (P) was a failure, while Henschel’s VK 4501 (H) was a great success. Main failure of Porsche’s design laid in its advanced power and drive system, which was prone to breakdowns and required continuous maintenance. Also Tiger (P) was longer than its competitor, what made it less maneuverable. Porsche also provided possibility to arm Tiger (P) in future with 150mm KwK L/37or 100mm L/70 gun, but it was never realized. There were also plans to utilize 88mm L/100 gun but they were also never realized. In July of 1942, Henschel Tiger - VK 4501 (H) was approved and went into production. Only five Tiger (P) were fully completed in July of 1942 by Nibelungenwerke with armored parts supplied by Krupp, before the production was stopped in August of 1942 (chassis number 150001-150010). Even before the rejection of Tiger(P)’s design, production began on 90 pre-production VK4501 (P) chassis and continued into early September of 1942. It was decided to equip two sPzAbts (including sPzAbt 501) destined for North Africa with Tiger(P)s. This decision was made simply because of the stage of development and the fact that Tiger (P)’s engines were air-cooled. Once again unresolved problem of technical unreliability led to the cancellation of the production. Only five fully completed Porsche Tigers were issued for training and testing purposes to the facility in Dollersheim, Austria. 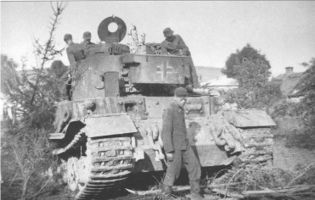 From August to September of 1943, three of those were converted into recovery vehicles designated - Bergepanzer Tiger (P). On September 22nd of 1942, it was decided to convert 90 of the existing chassis into Ferdinand / Elephant, heavy assault gun and tank destroyers. 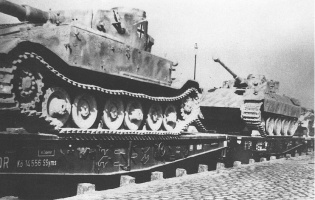 Based on the experiences of Stalingrad street fighting, on November 22nd of 1942, Hitler approved the production of a single Rammtiger - barricade and obstacle destroyer. Porsche completed the planning stage by December 7th of 1942 and on January 5th of 1943, Adolf Hitler decided that three VK4501(P) chassis are to be modified and converted to Rammtiger / Raumpanzer Tiger (P). 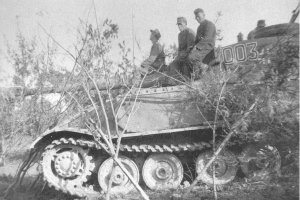 This lightly armed (with MG) vehicle was to be a standard VK4501 (P)’s hull mounted with streamlined upper superstructure and front mounted plow (ploughshare). The streamlined shape of the superstructure would allow the rubble to slide off the vehicle. 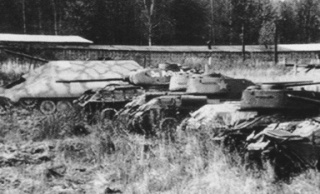 In May of 1943, three superstructures were completed and three Rammtigers were ready in August of 1943. Their fate is unknown after August of 1943, but it is unlikely that they saw any combat and probably remained at Nibelungenwerke. 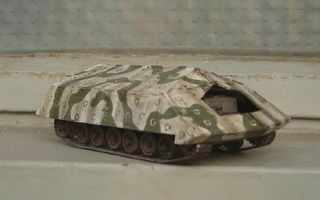 Other sources state that only 1:10 and / or 1:15 scale model was made when the entire concept was rejected and three chassis were used as previously planned. One of the Tiger (P)'s historical armaments, the 8,8 cm Flak 41 L/74, is missing. The 8,8 cm Kw.K. 43 L/71 was intended for the Tiger II, not Tiger (P). This page was last modified on 18 July 2018, at 16:40.